It has taken roughly six months to liquidate our former shore side lives and officially move onto Indigo Moon as our new home. We planned all along to be in Key West by Christmas, but that deadline came and went as we continued to prepare for our departure. Hey . . . Wait a minute! Did I say DEADLINE???? We don’t need no stinking deadlines! But, old habits and mindsets cemented over decades of conditioning are hard to break. Note to selves: we must immediately focus on removing the term “deadline” from our vocabulary, at least during our voyaging years. Final preparations for our adventure happened in a natural timeline largely beyond our control. 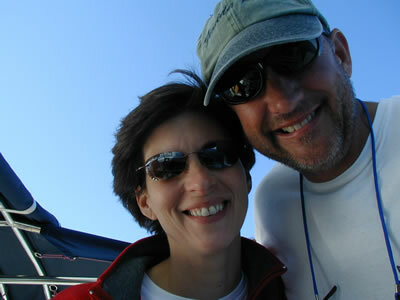 Our official departure occurred on January 6, 2005, as we cast off our lines from Mandeville, Louisiana. 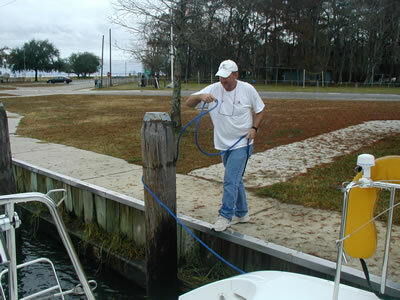 We vacated our slip at South Shore Harbor in New Orleans on January 1, 2005 and crossed Lake Pontchartrain to the North Shore to spend a couple of days getting a few last minute repairs, provisioning, and to finish up all pending business. It is a dreary, grey winter morning in Mandeville, Louisiana; just the kind of cold winter weather that has always depressed me and made me wish for a life in the tropics. Thus, this weather is fitting for bidding farewell to Louisiana’s cold and humid winter. Indigo Moon is loaded down with tons of provisions and gear, so much so that her antifouling bottom paint is no longer high enough on the hulls to fully protect them. We will have to raise her bottom paint a few inches to protect the new, higher waterline from barnacles and algae. At the stern, her transoms tell the tale of being loaded down. The “sugar scoop” transoms are now just barely above the waterline in the brackish water of Lake Pontchartrain. Of course, we are headed for real salt water soon, and the higher salt content will provide more buoyancy. Indigo Moon will float somewhat higher in true salt water, but nonetheless she is now heavy and I am eager to see how she performs in the open sea. 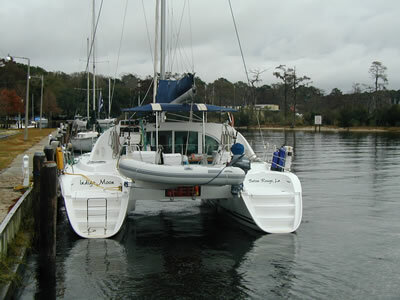 Indigo Moon sits low in the water at Mandeville, loaded down with a brand new dinghy and 15 hp four stroke engine, dive gear, many tools, 150 gallons of water, and all sorts of other provisions. At 10:00 am, the moment we have been waiting for is here. Like so many so-called big “moments” that we all anticipate in life, turns out this one is not all that dramatic. With a simple flick of the last line from around a piling on the Mandeville seawall, our new seagoing life is born. Buddy releases the last line to free Indigo Moon and she is released from her year-and-a-half long tenure in Louisiana. Under very light winds, we head east under power toward Slidell and the Rigolets, to make our way to the Mississippi barrier islands where we can then head straight out into the Gulf of Mexico to the southeast and directly to the Florida Keys. 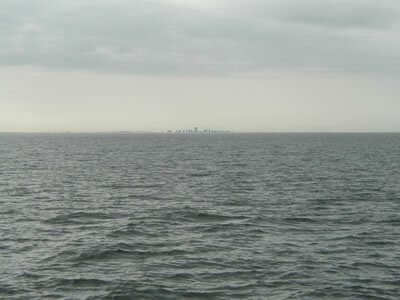 Lake Pontchartrain is smooth and the air is unusually clear such that we can see downtown New Orleans eighteen miles away on the horizon to the south. Even though she is loaded down, Indigo Moon’s cruise speed under power is the same as before, about 7.2 knots, and I am happy about that. The plan is to make the Gulf crossing within a good “weather window.” I have triple checked the NOAA 72 hour forecasts and charts for weather in the Gulf and it looks great for a three to four day trip straight across to the Florida Keys. I like open water, offshore passages where I can monitor traffic on the radar and stay miles away from collision hazards when underway, especially at night. Hugging the coast is just too hazardous at night for my liking considering all the boat traffic and obstacles to run into. 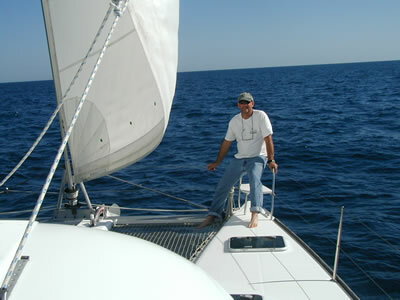 Our route will take us roughly 550 miles, mostly far offshore in the open Gulf. 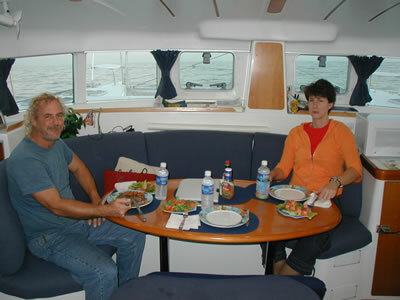 This crossing will be the farthest offshore trip made by Melissa and George Huffmann, our guest crew. Of course, this is the same crossing I made a year and a half ago when I brought the boat to Louisiana from Ft. Lauderdale, so I am not anxious about it. New Orleans ’ skyline is visible and we wave goodbye to the “Big Easy” as we steam eastward toward Slidell . We need to take on fuel and ice, but the fuel dock in Slidell is out of fuel! 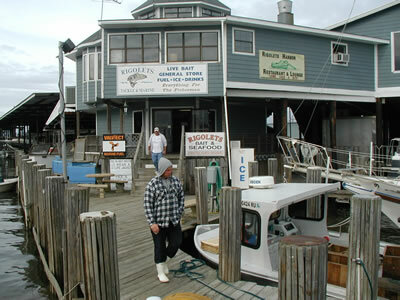 So, we head onward to Rigolets Tackle and Marine where the local fishermen fuel up. We take on a total of 180 gallons of fuel and Buddy secures all the extra containers of fuel in the cockpit. After fueling up and taking on a hundred pounds of ice, we are finally ready to depart non-stop to the Keys. 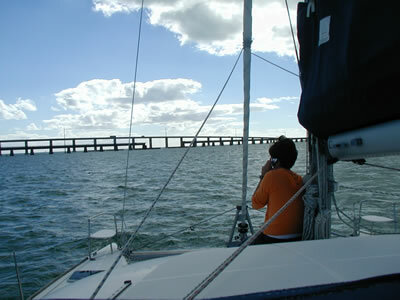 We will exit the Rigolets and make way east in Mississippi Sound until we arrive at Cat Island Pass, south of Gulfport, Mississippi. We have to head that far to the east before we can turn to the southeast and get a straight shot at the Florida Keys. Turning south any sooner would head us into the Louisiana marshes that extend far out into the Gulf to the southeast of New Orleans. 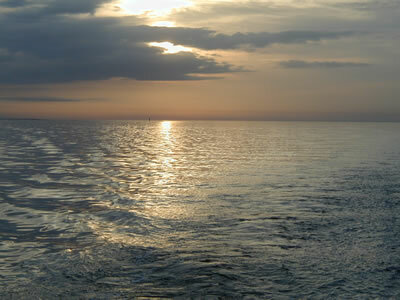 On previous passages through Mississippi Sound, Melissa and I have encountered very rough conditions, but this time the waters are silky smooth. We are simultaneously appreciative and suspicious of Neptune. It feels as if Neptune may be granting Melissa and me a favor; a departure gift of smooth waters. At least that’s what we’d like to think. Or, is it a baiting into deeper waters where Neptune will not be so kind? We sailors are a superstitious bunch! The waters of Mississippi Sound are the smoothest we have ever seen . The sun has set before we reach Cat Island. No moon at all tonight. It seems we always make dark passages, but we are at the mercy of the weather, not the moon. As we exit Mississippi Sound and head out into the Gulf proper, we locate the safe water markers of Cat Island Pass by using GPS chart plotter, radar, and then finally a “Q-Beam” spot light at close range to verify we are on course and at the correct markers. It would not be very yachtsmanlike to begin our Adventure by running aground trying to get out of Mississippi Sound, so we are extra careful during our exit to the open sea. We are all excited and up late. I decide to take the first “real” watch, from midnight to 3:00 am to get us far offshore so that Melissa and George can get some sleep and will not have to worry too much about traffic on their first watches as they gain experience with the radar, etc. No matter what your experience level, it takes a few watches to get comfortable with all the electronics on any given boat. Man oh man, I get more than I bargained for on that first watch! The fishing fleet is out in full force. These are very large offshore trawlers, sometimes three or four in a company fleet working together. It is a challenge and all of my radar training in the Navy comes in handy. Then things start to get interesting. At about 0045 (that’s a quarter to one in the morning for you non-military types), I enter an extremely thick fog bank. The running lights of Indigo Moon illuminate the fog such that there is a red and green glow off the bow and white glows from the steaming light forward, halfway up the mast, and to rear off the stern light. I am under power, because the wind is right on my nose. I can’t see more than twenty feet beyond the bow and stern. Spooky. Traffic is thick and I am constantly tracking other boats and altering my course as necessary to avoid collisions. 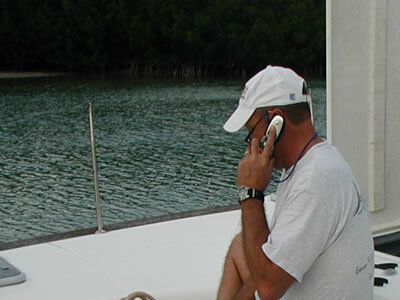 It seems that all craft must be running on radar as we manage to all miss each other without any chatter at all on the VHF radio. At one point, I can smell a shrimp trawler as if I am standing on her deck (an unmistakable smell that combines heavy scents of diesel fuel, diesel exhaust, and almost rotten shrimp). When the wind is just right, I can hear her engines laboring against the drag of the nets she’s pulling. At another point, the fog lifts a little, and I see a glow of white lights a few hundred yards away to starboard. 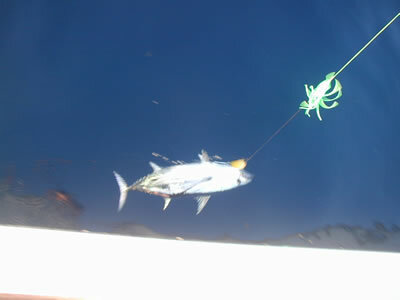 It’s another shrimper for sure with bright deck lights to facilitate sorting its catch. My favorite in this “zero visibility radar waltz,” though, is the Miss Diane. Though nowhere near me, thank goodness, Miss Diane’s skipper announces on the VHF radio every few minutes (in heavy southern redneck accent): “Thu-is is the Miss Diane ah-located at (so and so degrees North and so and so degrees West) and a runnin’ in tha fog ona course of 325 degrees at 19 KNOTS!” (That’s over twenty miles an hour!) I anxiously check the coordinates each time and I am pleased to note that Miss Diane is about 15 miles away and heading away from us. Melissa comes up at about 0230 to see how I am doing and is very unsettled by the thick fog. She tells me later that she has trouble going back to sleep, thinking her first watch will be alone in the fog with not much radar experience in heavy fog. She didn’t know it at the time, but I never would have allowed that anyway. George takes the helm at 0300. We are out of the fishing fleet. The fog lifts quickly for George and he has the pleasure of an uneventful watch. Melissa relieves him at 0600. Melissa’s first sunrise while on watch is beautiful and clear. That old sun can look pretty damn good after a night of thick fog. The sun rises on Melissa’s first watch. Bridge deck slamming happens to some degree on all catamarans. Indigo Moon has very good bridge deck clearance and is not a chronic “slammer” like some cats. But on this course, directly into three to five foot waves, it is bound to thump now and then when a five to six footer rolls just wrong under her belly. George is especially unsettled by the occasional bridge deck thump. This is his first trip on a catamaran and he can’t sleep because, according to him, any such noise on any other boat he’s been on means something really bad has happened, like a motor just broke loose from its mounts or the mast fell down! And so, we are heading into the wind, doing about six knots. Until the seas subside, or we change our angle into the waves, we will continue to thump now and then. By the second day, everyone sleeps despite the occasional thump - just like people learn to sleep through trains passing when they live right next to railroads tracks. 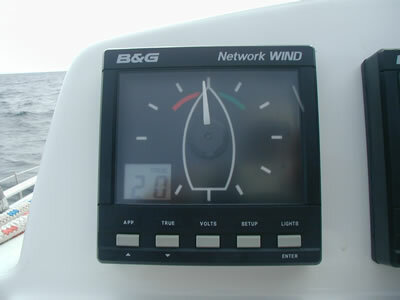 As the trip progresses over the next few days, the wind and seas subside, just as predicted. By the third day, we heard no more slamming from the bridge deck. 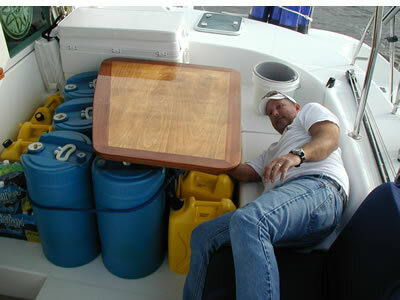 Each day, refueling is necessary and we use the extra jugs of fuel. 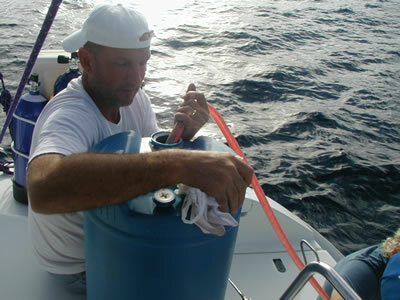 Buddy uses siphoning to transfer fuel from fifteen gallon jugs to the boat’s main fuel tanks. 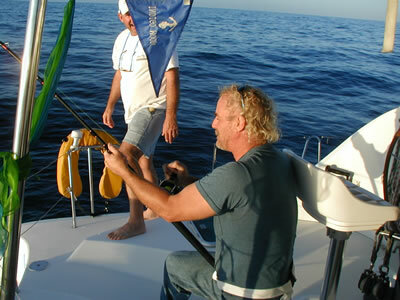 Only two fish are caught despite dragging baits all the way across the Gulf. Both are Bonitos and both hit on George’s watch. Buddy watches George fight a Bonito. Melissa did an awesome job of provisioning the boat before we departed. We have hot meals every night. There is something special about pulling off good hot meals while miles out at sea on a small boat: steaks, grilled chicken, spaghetti, chicken quesadillas, and lots of other goodies. It sure tastes good. On three hour shifts, the crew is always tired for the first three days and hot meals are a necessity for morale and energy. Steak dinner at sea with all the trimmings. 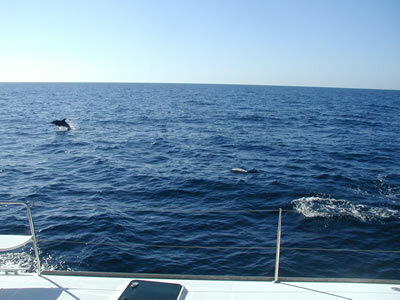 On the third day, they come jumping like puppies – small spotted porpoises that live far offshore and love to see a boat. 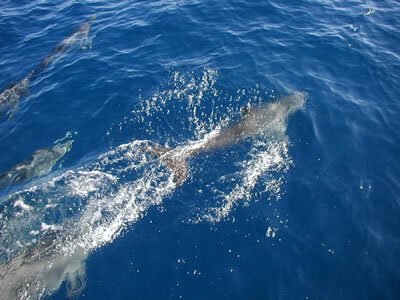 We see them a hundred yards away, swimming toward us at high speed, jumping to meet us. It almost seems they are children saying “I saw the boat first - - no, I saw it first!” as they jump over each other racing toward us. 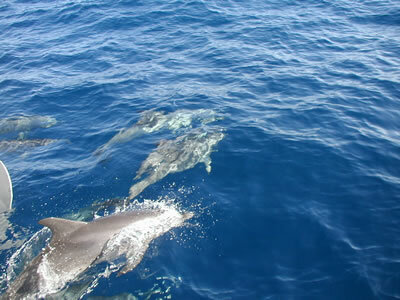 They are excited and swim with us for quite some time. Dolphins come running to see The Moon. 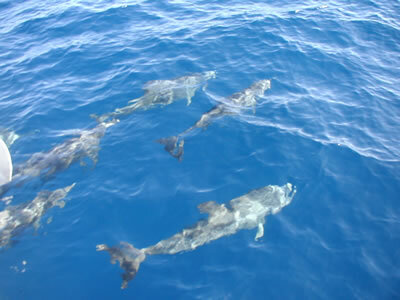 Dolphins stay with us for quite a while. On day three we raise the sails. Finally, the wind has shifted twenty degrees off our port bow so that we can set sail close hauled and kill the main engines for a while. 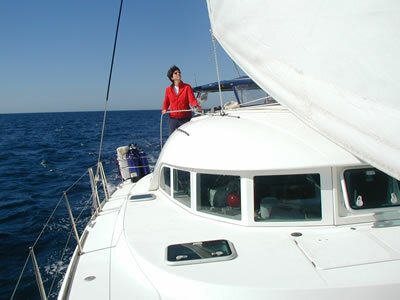 We manage 6 knots in the light breeze and enjoy the majesty of sails in the open sea, all while the weather finally warms up to shirt-sleeve temperature. Buddy enjoys the warm weather. Melissa and Buddy on the high seas. This trip is a great one for Melissa. She is naturally apprehensive at first about the long passage, but she eagerly takes her watches at all hours of the day and night as the schedule rotates every three hours. The seas are rather rough the first day and Melissa suffers from very mild sea sickness type nausea. She finds complete relief both while sleeping and while at the helm. She doesn’t have any trouble sleeping through the bridge deck slamming. So, needless to say, Melissa is catching up on her sleep and is well rested for all her watches. On the mechanical failure downside, our fridge is on the blink by day two. Hmmm . . . the fridge is warm. Why? Let’s see, the little 12 volt Danfoss compressor (finest kind to have) is humming perfectly. Hmmm . . . the water pump is running perfectly and there is plenty of water coming out of the discharge, so the unit is getting cooled properly. That leaves only one possibility: a leak somewhere has allowed the Freon to get low. Despite the fridge going down, we have enough ice to keep our perishables fresh until we arrive in Marathon, Florida. Also, one of the main engines has sprung a leak at the exhaust elbow and is seeping a small amount of seawater. This does not effect running the engine for now, but must be fixed as soon as we get to Marathon. On day three we are 150 miles offshore, running radar on a twenty four mile range for twenty four hours and never pick up a target. That means for over 150 miles we travel a path 24 miles wide where we are the only things on the surface of the Earth. Melissa looks around and realizes the perpetual “roundness” of being “out there” - nothing but an unobstructed indigo circle of Gulf as far as the eye can see. She says it is something she never really thought about before. Night watch is still my favorite. With no moon, the stars are blazing and the Milky Way is as bright as ever. One of my night watches is especially satisfying. Melissa bought me a Nike MP3 player for Christmas. It holds about 8 CD’s worth of music and fits in the palm of my hand. I steam along at 7 knots in calm seas, looking at brilliant stars and counting shooting stars while listening to Robert Randolph and the Family Band. I am surrounded by high technology yet physically as far away from civilization as I can get. “This is not something you get to do everyday,” I tell myself. I realize that I have a quiet smile on my face as I let my soul take in every ounce of the experience. It really is “other worldly.” I might as well be traversing outer space in my own little starship. 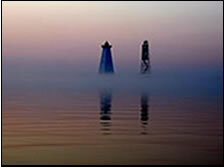 In this extreme darkness, the surface of the water is not visible, nor is the horizon. All that is in view is Indigo Moon bristling with all her illuminated gadgetry and the sky full of galaxies and stars. It is a grand spectacle. We left Mandeville on a Thursday. 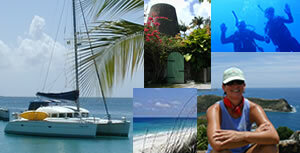 Four days later, on Monday we reach Marathon in the Florida Keys. 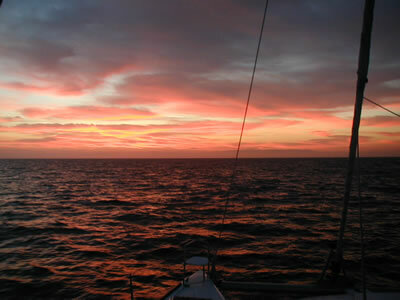 We arrive at the flats fifty or so miles north of the Keys about 0200 on Monday. I am on watch going crazy trying to drive through all the crab and lobster trap floats. The propellers on Indigo Moon are not protected by a keel or skeg and running over one of the trap floats would most likely result in a rope wrapped tightly around the prop and maybe even cause a leaking oil seal around the propeller shaft that would require an expensive haul out and repair. In order to detect the floats, Melissa and I use a “Q Beam” to steer around them. George can’t sleep with us running around so he comes up to help shine the light. We make a pot of coffee and drink it all to stay awake. Once we get into water shallow enough to anchor, we decide to get some sleep and then make our way through the crab pots to landfall in the daylight hours. Within five minutes of anchoring, we are all fast asleep, despite having about three cups of coffee an hour earlier. After daybreak, Melissa cooks us a hot breakfast of bacon, eggs and biscuits and we get ready for the final leg into Marathon. Once close to Marathon and within cell phone range, we start calling friends and family to let them know we have made safe passage. Melissa on the cell phone as we approach the bridge at Marathon . Buddy makes a few calls too. It was a great trip across the Gulf. It is wonderful to be in the Keys where it is warm, sunny, and laid back. That’s all for now, folks. We have been too busy to keep up with trip reports immediately as things happen. We hope to reach equilibrium in a few months such that trip reports are more timely. A few weeks of hard work on Indigo Moon in Fort Lauderdale, where we visit our friends and take advantage of all of the fabulous services this true mega- yachting community offers. 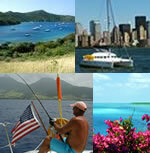 As of today, February 4, we are sitting aboard Indigo Moon in a marina in Ft. Lauderdale. We splashed her a few days ago after having her out of the water “on the hard” for a week. Where is our next destination? Probably Key West, then the Bahamas, and down to the Virgin Islands, but this could all change on a whim. As I have said, our plan is to make sure that at all times there is no plan. In closing, thanks to all of you for the supportive e-mails we have been receiving. It is great to hear from you. Just remember, we don’t have internet access all the time. It may take a week or longer to answer your e-mails, so please be patient and don’t stop writing.